Divination & Joy contains an experiential dowsing system that helps people verify their own insights and increase their intuitive abilities. This divination method, more precise than Tarot, can help with simple, as well as more complex decision-making and clearing of life issues. 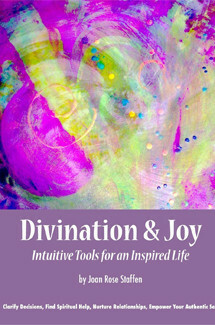 Divination & Joy contains twenty-five Intuitive Charts™ to assist people with their life, love, relationships, spiritual and therapeutic issues. People are taught how to do an Intuitive Reading for themselves and others. This work by Joan Staffen is part of my daily life. I turn to it for all sorts of needs, big and small. The charts provide a much more robust avenue for working with a pendulum than yes or no questions. They also allow one’s ego to get out of the way, keeping the reading on the intuitive level. This is the best dowsing book out there!